An elegant means to base a beautification station, the Elysee 5 Drawer Dressing Table is a sophisticated and stylish addition to the bedroom. Beautifully crafted using an abundance of glass, polished to a mirror shine, the Elysee 5 Drawer Dressing Table is undeniably opulent. As well as being designed with exceptional materials and adhering to a clean and regal frame the Elysee 5 Drawer Dressing Table features such captivating enrichments as the crystal handles. This culmination of sophisticated elements makes the Elysee 5 Drawer Dressing Table a perfect fit to any regally decorated room. The Elysee 5 Drawer Dressing Table features, as its name suggests, four concise drawers and one modest sized drawer, which are ideal for storing the likes of make-up. Though it is stunning as a solo piece of furniture, the Elysee 5 Drawer Dressing Table is perfectly partnered with a dressing table mirror as well as the Elysee Mirrored Dressing Table Stool. Arriving virtually complete, the Elysee 5 Drawer Dressing Table only requires minor steps to be taken to be fully assembled. Merely attach the handles and, optionally, fix the Elysee 5 Drawer Dressing Table to the wall by following the comprehensive instructions included. 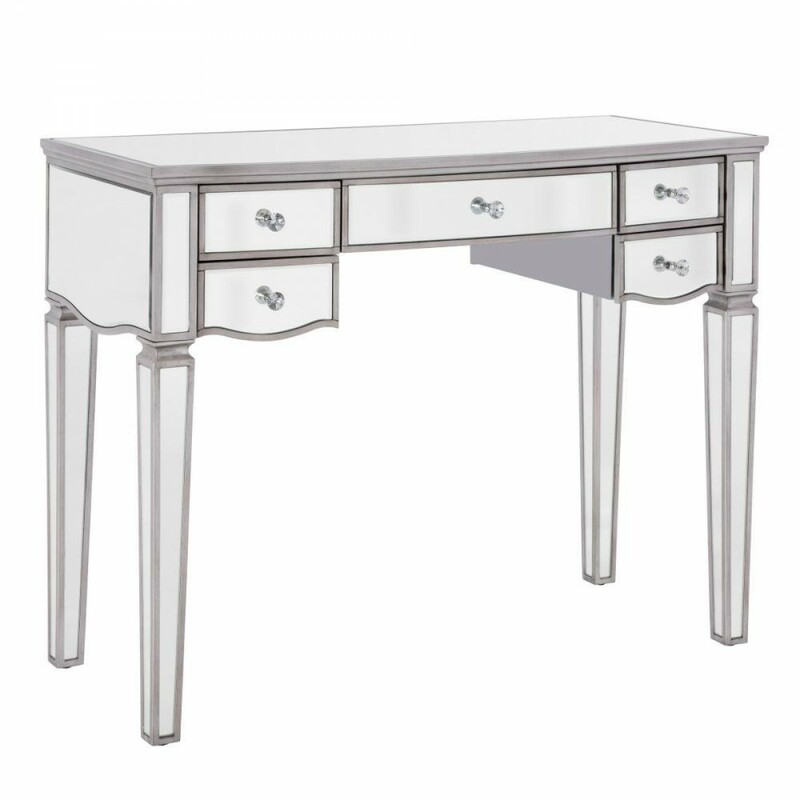 The Elysee Dressing Table Stool is available to purchase separately. The Elysee 5 Drawer Dressing Table is part of the Elysee Mirrored Wooden Bedroom Furniture Collection.